Svetlana Zakharova is a supernova ballerina, a breathtaking and explosive Bolshoi star who illuminates the stage with her extraordinary artistry and flexibility. Svetlana’s talent is so intoxicating she absorbs all attention and outshines almost all other dancers on stage. She’s so captivating that you almost don’t want to blink for fear of missing one of her famous 180 degree extensions, her second over split, her indulgent backbend, a flick of her hand or her high arched pointe. The ‘Amore’ triple bill reveals three different dimensions to Svetlana through three diverse ballets showcasing her physicality, musicality and personality. There’s nothing quite like seeing Svetlana perform, every moment spectacular and to be savoured. Her body is a force of nature that she wields with complete control and technical expertise creating a rare and unforgettable performance. Opening ‘Amore’ we emerge in Dante’s adulterous tale told in ‘Francesca da Rimini’ (choreographed by Yuri Possokhov), which sees Svetlana and the divine Denis Rodkin falling in love against a doomed and dramatic backdrop of oversized sculptures and a spectacular supporting cast. Svetlana’s classical prowess radiates, she’s graceful, beautiful and breathtaking in her long white dress, enhanced by her fellow female dancers dressed in striking long flowing red dresses. An emotional narrative ballet filled with love, lust and death that presents the depth of Svetlana’s character portrayal and passionate performance. 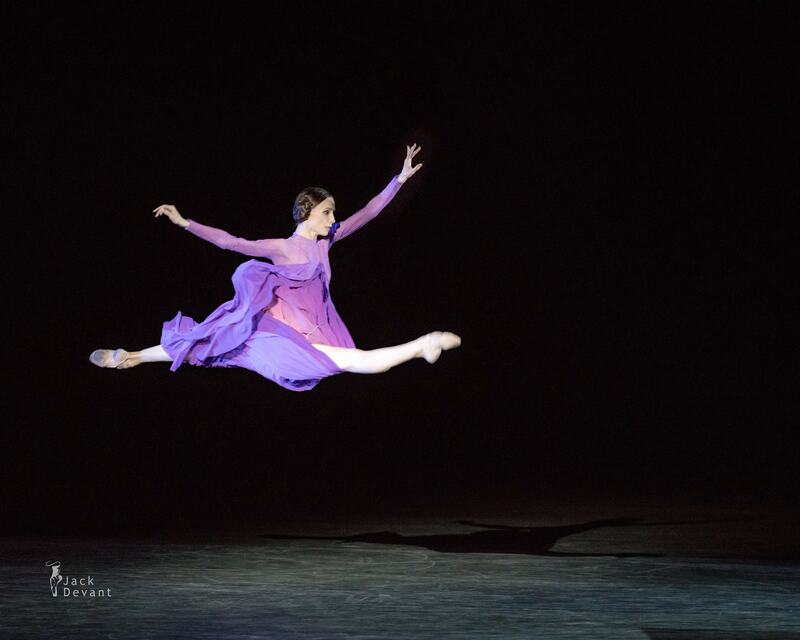 ‘Of Rain Before It Falls’ by choreographer Patrick de Bana sees Svetlana sat simply at a table in a long floating purple dress that draws the eye to her and her alone. Although she’s also joined by the choreographer and Denis Savin, they can only play a supporting role to Svetlana as she elegantly dances in ballet flats creating a more raw sense to her performance as she finds herself choosing between two men. Although an intimate piece of choreography, Svetlana is she’s such a phenomenal talent that she shines and elevates the piece that sees her two male suitors mere backdrops to her emotional ordeal. The final ballet ‘Strokes Through The Tail’ choreographed by Marguerite Donlon is the standout piece of the evening. Original, witty, stylish, creative and memorable it balanced out the triple bill programme, ending on a satisfying high note. This piece brought out a comical and playful side to Svetlana who was accompanied by five superb male stars: Mikhail Lobukhin, Denis Savin, Vladislav Kozlov, Alexei Gainutdinov and Anton Gainutdinov. These men almost stole the final moments of the show with their humour and fabulous technique all while dressed in long tutu skirts and bare-chested tuxedos. It was great seeing Svetlana having so much fun and performing refreshing choreography that seemed to have hints and nods to the ballet world on so many different levels. An exciting piece of choreography and a joyous performance by Svetlana and her tutu’d boys.